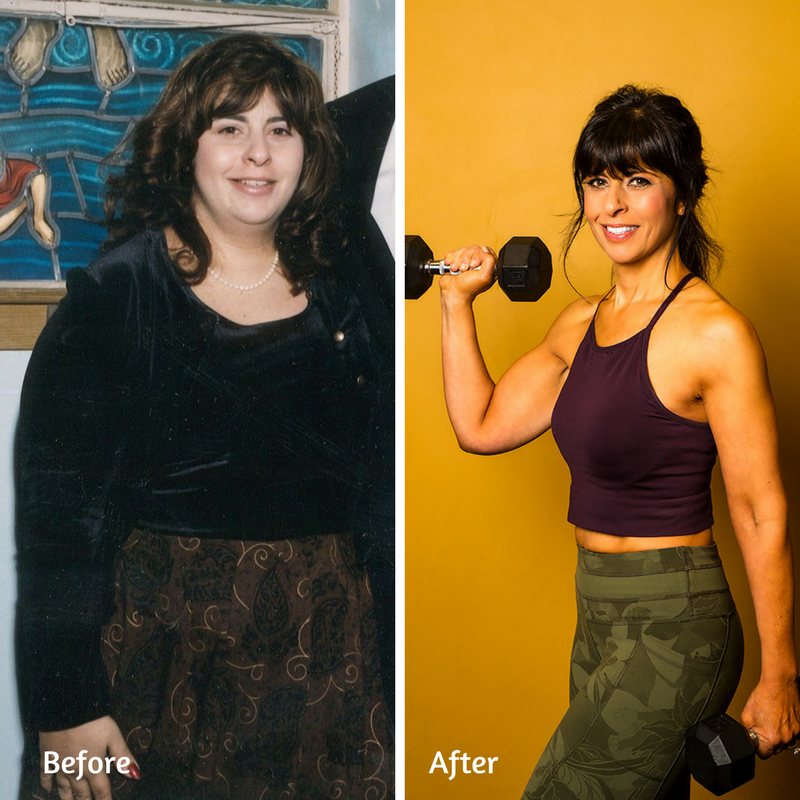 Charlene Bazarian’s awful fat shaming moment changed not only the trajectory of her life, but also helped her encourage and inspire thousands of others and led her to meet some of her fitness heroes like Jillian Michaels, Gilad Janklowicz of Bodies in Motion and Emmy winning actor, Steve Burton. Charlene Bazarian, shares her wonderful transformation journey on Women Fitness. I had gradually put on weight over the years. It started with the “freshman fifteen” in college, and then a few more pounds piled on in law school, then a few more when I began working in an office, and a few more after I got married and then it was all compounded by having children. Along the way, I felt like I had tried everything from “Atkins to Weight Watchers” and while some plans worked for a brief time, I would invariably find the weight creeping back on. I think you have a vision of what you think you look like in your head and I had gotten to a point where the image in my head didn’t match the image in my mirror. It was a fateful day at a day spa that sparked my “aha” moment. I had treated myself to a day of beauty at a popular day spa and was mortified when I had to return to the receptionist to ask if they had a larger robe as the one size fits all robe that she had given me didn’t fit. I’ll never forget how embarrassed she made me feel, making me repeat the question and then loudly saying how she wasn’t sure they had anything large enough to fit me! I remember going into the dressing room and vowing to myself that moment that I was never going to feel like that again. I channeled that awful fat shaming moment to being what felt like my hundredth first step to losing 96 pounds. When I first began my weight loss journey, I set small mini-goals so as not to get discouraged and overwhelmed as it seemed that losing close to a hundred pounds was an insurmountable task. I started with goals of five to ten pounds and when I would hit that goal, I would give myself some sort of non-food related treat like a manicure, new shoes or something fun to celebrate. 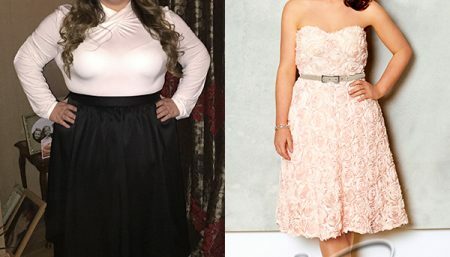 I also decided for myself to only buy a few items of clothing when I would go down a size and I would tell myself that I didn’t need to spend a lot of money as I wasn’t going to be in this size for long. I would also be sure to donate larger sizes so I didn’t have “fat” clothes to fall back on. 3. Moderation is for maintenance! I also realized there’s a challenge for the people closest to you to accept your fitness and diet efforts. I joke that saboteurs are everywhere with their tempting catchphrases of “Just this once,” “We’ll start tomorrow,” or “You’re no fun anymore.” It took repeated reinforcement for everyone to accept my workout was getting done no matter what and that no amount of offers were going to get me to split the loaded potato skins! I began my fitness journey by doing home video workouts by Gilad Janklowicz of Gilad’s Bodies in Motion, Cathe Friedrich, Holly Perkins and Jillian Michaels. I think one of the biggest reasons for my fitness success this time, was that I had incorporated weight training into my efforts. Any time that I had attempted to get in shape, like most women, I turned to cardio based exercises. I found weight training truly was the single best thing I did for myself. I eventually joined a gym and then got a personal trainer as I find they really help challenge you. Most women I think avoid heavy weights thinking they’ll bulk up, but it couldn’t be further from the truth! Weight training builds more lean muscle mass and burns more calories even at rest! A typical day of fitness for me starts out in the morning. I recommend doing something first thing in the morning and I call this the “insurance” workout. It guarantees that I’ve at least done something before the world tries to steal my day. I call my morning workout “my coffee before my coffee.” A typical morning workout for me is a ten minute yoga routine, followed by a light warm up, ten minutes of ab/core exercises and then I will do one or two muscle groups each day with weights and alternating muscle groups to allow for recovery. Later in the day, I will work in some cardio. I have a rule that unless it’s a family movie or a big sports game, that I DVR my favorite shows, and if I want to watch them, I hop on the exercise bike to get my cardio in. I may also do a walk or an actual bike ride and somedays, I’ll pop in a fun cardio workout DVD or go to the gym and use the elliptical machine. I have a Fit Bit and I used that as my “in addition” to my workouts and as I really agree with the recent buzz about “sitting being the new smoking,” I aim to get 10,000 steps in a day so that I’m mindful of moving. I also will avoid an elevator up to twenty flights and will always opt to take the stairs. While many people don’t think they have the time to workout, I find that my workouts give me the strength and energy to tackle the rest of my day. As a working mom of three boys, I find mornings the busiest time of day and prior to my weight loss, would often just skip breakfast or grab something I “thought” was healthy (a low fat blueberry muffin—now I realize it was more like cake! Or a bagel, which isn’t much better!) I have had a Luna Bar for breakfast almost every day. I really find they are a perfect on the go bar, they taste great and I look forward to it with my morning coffee. On days I don’t have a Luna Bar, I would do scrambled eggs and wilted spinach or I really love Stack’d Nutrition’s Protein pancakes (they have fabulous gourmet flavors and taste incredible!) Mid morning, I will have a Burton Nutrition Get Fit Protein Shake (sometimes just as a shake, other times, I’ll mix it in the blender with some fresh fruit and make it more like a smoothie). For lunch, I tend to choose a salad with grilled chicken with a light drizzle of a oil and vinegar or a light balsamic dressing. I also like to toss some of the Burton Nutrition Get Fit Whey protein into some oatmeal and mix in fruit and nuts for a warm lunch choice. Other choices may be a healthy/lower calorie wrap with turkey and veggies or some peanut butter with fresh blueberries or sliced fresh strawberries which is a little diet hack I do to avoid extra sugars like jam. For dinner, I will usually have a salad, grilled or broiled skinless chicken breast, turkey, lean beef, bison, salmon or shellfish, lots of green veggies (broccoli, spinach, asparagus, kale, or green beans are some of my favorites) and I swapped out regular potatoes and white rice for sweet potatoes and brown rice. I really avoid pastas and breads as I find the “ones too many, threes not enough” rule applies to starchy carbs for me. As a general rule, unless it’s cauliflower, if it’s white, I try to avoid it. For snacks/splurges now that I’m in range, I’m a big fan of Fit Vine Wine for times when I want to have a cocktail. It has less carbs, calories and sugar and best of all doesn’t taste like it! I also love Rice Works Brown Rice Crisps. They’re like gourmet tortilla chips and are made from brown rice. I usually pair those with some of my homemade guacamole. I also use the Get Fit Whey protein to bake a healthier “oatmeal cookie.” Raw almonds and cashews are also go to snacks for me. When I first lost weight, a few high school girlfriends reached out to me on Facebook to ask how I did it. I began giving them tips and advice on what I found worked for me. I ended up creating a Facebook page, called FBJ Fit, and thought it would be just a few friends but it has grown to over 7000 followers and has led to my also creating the FBJFit.com blog where I readily share tips and information to anyone else who may be struggling. It’s sort of my way of giving advice to countless others that are struggling that I wish I had when I had tried so many other times to lose weight. It has been unbelievably humbling and gratifying to take an embarrassing fat shaming moment and channel that into a positive by not only helping myself finally lose weight and get in shape, but helping others too. I hear from people around the world who will tell me that something I said, or some part of my story resonated with them and gave them hope to try again. I know a lot of people look to me for advice, encouragement, and support for weight loss and I really feel that this helps me as much as it helps them. I feel a tremendous responsibility to “walk the walk.” I encourage others to choose “worth it” treats and while I still believe “moderation is for maintenance,” now that I’m in my goal range, I try to remember that, “It’s not about never having a cupcake, it’s about not ALWAYS having a cupcake.” I was also able to meet some of my favorite fitness hero/icons along the way of my journey. I got to meet Jillian Michaels when she was filming a show at my local gym. I was asked to go to New York to be filmed at a fitness conference to meet Gilad. It was an amazing experience to finally meet a person I felt like I had already known for years as I worked out with him in my living room so many times!! I was also able to meet and interview actor, Steve Burton, and talk to him about his reasons for starting a nutrition company. I’ve been blessed with getting to work with some amazing personal trainers over the years who have become dear friends. My first trainer was Carla Dunlap, a former Ms. Olympia and I remember telling her that I was going to be her best success story. She was unmoved by my declarations and simply said, “Everyone says that.” I smiled, and said, “Oh, but I mean it!” I use my blog and my experiences to set an example not only for anyone who follows me, but for myself as well. It really is day to day choices even now that I’ve managed to keep the weight off. There’s no touch down dance or finish line! After losing almost half of my body weight and keeping it off, I hope to share what I’ve learned to an even wider audience. It’s not too late, you’re not too old and very little is impossible. I truly feel better (and look better) now than I did even decades ago. I hope through my social media and blog platform to continue to share my adventures and efforts to continually make progress with my own fitness and clean eating choices. When I had tried to lose weight countless times before, I would think that I knew what to do, I just didn’t do it. I have since learned that weight loss isn’t a straight line and that it’s a constant learning process of what works and what doesn’t. My goal for myself for 2018 to inspire others is to really live out loud, try new things and to help spark as many aha moments for as many people as possible!